Today was another glorious late spring day with the temperature in the mid 70s, the sky cloudless and a gentle breeze rolling off the Sussex Downs. To make the most of the good weather, we headed down to the Forest Way. The Forest Way is a bridleway, walking, and cycle path (part of the National Cycle Network Route 21) which runs between Groombridge in Kent and East Grinstead in West Sussex. It is a section of a former railway branch line which ran between Tunbridge Wells and Three Bridges. The line was closed in the 1960s due to government cut-backs. We decided to tackle the section of the path between Withyham and East Grinstead. There is limited free parking where the path crosses Station Road in Withyham, so we left the car there and headed west. Much of the path is lined with tall trees and other flora which offered welcome shade from the sun, and ample attraction for many butterflies and dragonflies. Various small tributaries and brooks pass under the path, running in to the River Medway as it snakes through the fields to the north. Perfect landscape for young explorers! Before long, we reached the former Hartfield Railway Station which has retained much of it character, front and back, and, today, seems to be a nursery or daycare centre. After a short rest at a bench in the shade by Hartfield Station, we continued to Forest Row, some three and a half miles farther on. 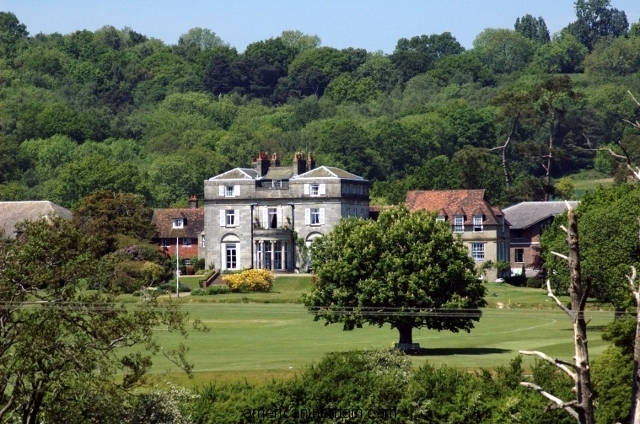 Approaching Forest Row, between the trees on the north side of the path, we noticed a mansion among the hills and pastures which, at first, we thought was Hammerwood House, but later found out was Ashdown House School (see picture). At Forest Row, we branched off to the left on to the former Station Road which brought us out to the familiar village green. The Co-op for ice cream and the public conveniences behind the Forester’s Arms Pub were our principal ports of call before heading back to the path. It is difficult to discern exactly where the station once stood at Forest Row as both the land where it once stood, and the area where the line previously crossed the A22 have undergone significant development. Crossing the A22, the path rises on to an embankment and remains mostly shaded before reaching East Grinstead close to Sackville College about 2 and a half miles distant. We chained the kids’ bicycles outside East Grinstead library, (metaphorically) raided the local candy store and took the 291 bus back to Withyham to collect the car.